This large (17,675km2) licence is located on the East African Rift System (EARS), a proven oil trend. Over 6 billion barrels of oil has been found in the Lake Albert area of Uganda, in the western branch of the EARS. Another 600mmbbls+ have subsequently been found in the Lokichar Basin in Kenya on the eastern branch of the EARS. The discoveries have provided compelling evidence that the presence of oil in the rift systems is geographically more extensive than previously thought. Airborne gravity and magnetic surveys acquired during the first year of operations confirmed the presence of at least three sedimentary basins of up to 7,000m deep. These are the Kilosa, Kidatu and Kilombero Basins. Swala interpreted these to represent typical rift system, half-graben basins, analogous to the Lokichar Basin in Kenya where the Ngamia and Twiga South discoveries were made. In 2013 the Joint Venture carried out a total of 373-kms of regional 2D seismic over the three basins. 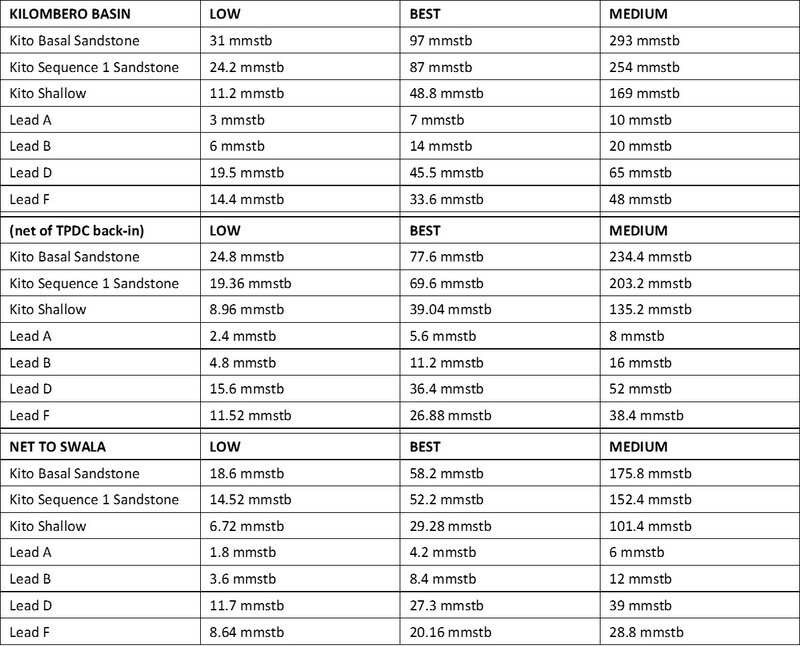 However, results from the fast seismic stacking velocities clearly indicated that the sediments in the Kilosa and Kidatu basins were well compacted and likely to be Karoo (pre-Neogene) in age. Although two modest-sized (and likely gas-bearing) leads were identified in the Kidatu basin, it was in the Kilombero basin which yielded the most promising prospectivity where the much lower seismic velocities suggested a Neogene-aged basin. Moreover, the seismic data indicated the presence of a very large (over 30km2) 4-way dip roll-over structure, subsequently named 'Kito'. 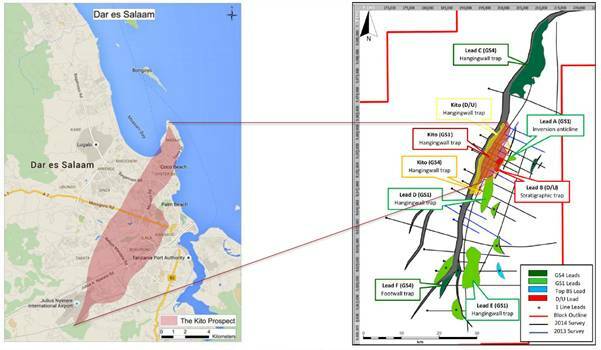 Following the results of the 2013 seismic survey, Swala focussed the 2014 survey to acquiring a further 413km of 2D data over the basin and Kito. Dip lines across the basin suggest the presence of both structural traps and traps against the main basin-bounding fault with possible Direct Hydrocarbon Indicators (DHIs or "Flat Spots") observed at several levels at the crest. The 2014 survey also identified a number of leads and prospects along the basin-boundary faults, extending in a 'string of pearls' configuration to the NE and SW of the Kito prospect. This configuration is analogous to the structural setting of the discoveries made to date in the Lokichar Basin in Northern Kenya. The Exploration Phase of the Licence was extended to 20th February 2017 to allow for the processing and interpretation of the seismic data obtained during late 2014 and early 2015. During 2016 the Company progressed its drilling planning, securing and acquiring a number of long-lead items with the aim of drilling in the second half of 2016. The delays in receiving all necessary permits meant that the Company could not drill in a safe fashion in 2016 and the Kilosa-Kilombero Licence was extended to 20th February 2018 to allow for Kito-1 to be drilled in the second half of 2017. In 2017, similar delays in receiving all necessary permits meant that the Company could not drill in a safe fashion in 2017 and the Company is currently awaiting an extension to the licence to the 20th February 2019. The Kilombero Basin is approximately 80 kms long. 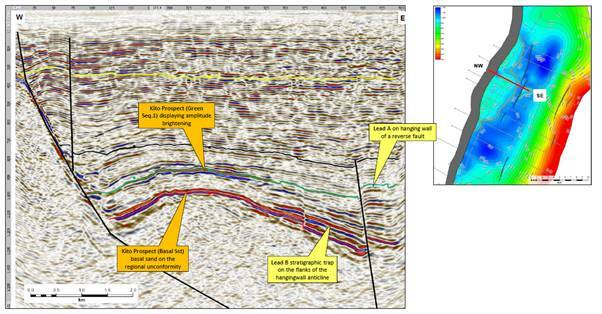 In late 2013 Swala acquired 2D seismic data over a 20km-long section of the basin. The results showed a large structural high adjacent to the basin-bounding fault that extended over a distance of 9km and was about 4km wide. Initial results also suggested the presence of a thick, Neogene-age basin (based on relatively low seismic stacking velocities) with a maximum depth to basement in excess of 3,000m. These sediments are interpreted to be similar in age to the now proven oil basins of Lokichar (Kenya) and Lake Albert (Uganda). This structural prospect, named Kito, was characterised by a Competent Person’s Report in 2013 and also in 2016 (GCA). Best Estimate recoverable hydrocarbons for the Kito prospect are 181MMBBLS. Dip lines across the basin suggest the presence of both structural traps and traps against the main basin-bounding fault with possible Direct Hydrocarbon Indicators (DHIs or "Flat Spots") observed at several levels at the crest.